Michael Echter was antsy. For months, his son had rebuffed him when he tried to offer advice and help in finding a summer internship in Los Angeles. 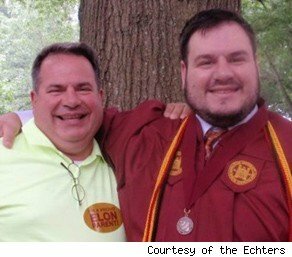 But after sending out 10 resumes and even cold-calling, Brandon -- then a student at Elon University in North Carolina -- had turned up nothing on his own. So Brandon relented and turned to Dad. Within two hours, Michael -- the marketing director of a New York-based public relations firm, MSL Group Americas -- had gotten his son an interview with a Los Angeles TV-production company, where he ended up interning in 2009. As the job market becomes increasingly tough, more parents and their 20-something children are struggling with the question of how much help is too much. For many parents, fostering independence takes a back seat if it means ensuring their child's gainful employment. As Michael puts it, "As a parent, you have to understand the, 'I want to do this myself' thing.... But you also have to draw the line, and the ball needs to be moved down the field." Indeed, the generation of parents who spent countless hours shuttling their kids to enrichment classes, then complained to their college professors about grades, now are meddling at work, wrote Gary Insch, Joyce Heames and Nancy McIntyre, researchers at the College of Business and Economics at West Virginia University. The researchers conducted a study of 340 students and found that they had grown accustomed to the constant involvement of their hovering "helicopter" parents. Nearly 7 out of 10 students said it was "somewhat" or "very appropriate" to receive help from their parents in writing a resume or a cover letter. The number who thought it was fine to have their parents contact a prospective employer was 1 in 5. When parents were polled by Michigan State University in 2007, they described even more extensive involvement. Nearly half of the parents said that they sought to directly obtain information on their adult child's employer; 1 in 10 said they actually participated in the negotiation of their child's salary and benefits. And most astonishing, 4 percent admitted that they had actually accompanied their adult children on a job interview. The trend has become so common that some companies have moved to formally include parents in the hiring process. Enterprise Rent-A-Car allows its new hires to designate another person to receive a copy of the company's employment packet, knowing that many younger employees will choose to have that information sent to their parents. While the company still expects to communicate directly with their new worker about the selection of benefits, it's understood that parents will be serving in an advisory role for their children. "We have seen that [including parents] simply helps people feel comfortable," said Marie Artim, a vice president for talent acquisitions with Enterprise. "We know that many young adults will turn to their parents anyway, so it's really all about anything to help us to attain our hiring goals. We've adapted." Such high levels of parental involvement raises obvious questions. How much help is too much? Does all this support ever backfire? Artim recalled one incident when a father called her to ask her how he could best help his son land an office position with the company. She tactfully suggested that the father back off. "I politely shared with him he would be much better off letting him do it on his own as it would reflect poorly on him," she said. Did the son get hired? Artim declined to comment beyond saying that he isn't currently working for Enterprise. Even parents who, in theory, think helicoptering is detrimental can't always help themselves when it comes to their own kids. Nancy Kislin, 48, is a psychotherapist in the affluent New Jersey suburb of Chatham. Acutely aware of the dangers of giving too much to children, she says that she raised her daughter, Gabrielle (see left), to be independent, work hard and give to others. But when her daughter seemed to hit a roadblock, Kislin instinctively jumped into action, without asking her daughter. Gabrielle, a senior at Johns Hopkins University, had been promised in February that she'd have a full-time job as a legal assistant come this fall. But when the law firm failed to produce a contract, Kislin got nervous, and logged on to Facebook to message a cousin who worked at another law firm. Within 10 minutes, her cousin reached out to Gabrielle to set up an interview. Having just graduated this past May, Gabrielle now is weighing offers from both law firms. "Should I have stayed out of it? Who knows?" says Kislin. "Yes, I knew I had pledged not to do this, knowing kids have to grow up on their own. But I said, 'Why not?' "
As for Brandon, he's now grateful that he got the internship. Though it was unpaid, he says the experience was the most important bullet on his resume and helped him to land his job as a media assistant for a nonprofit storytelling organization called The Moth. At 24, he supports himself and lives on his own in Jersey City.